Welcome to the week of February 19th….Happy President’s Day. I hope you were fortunate enough to have a day off with your children. Last week we worked on the individual performances that we will be presenting in March or April depending on testing scheduling. We also had the Chapter 10 exam. Those grades will be posting on Tuesday when I return to school. As you are painfully aware, the school shooting that occurred on Wednesday has left many of the teachers and students quite upset. Most of you didn’t know that I was a Parkland resident for 13 years. That was my “hometown” and my house was within walking distance to the Marjory Stoneman Douglas High School. My son went to that school and now my older son resides in my house. It has been quite the heartbreak. My grandson goes to West Glades Middle school which shares a portion of the Douglas field. He was outside when the shooter was firing his weapon. His teacher had the presence of mind to get her students in their classroom with very little trouble. They did not know what was happening at the time. The reason I am relaying this information to you is because we, at Franklin, do practice for such an occurrence. I would very much like you to speak with your children on the importance of remaining silent and vigilant when we have these drills. It is because we practice these drills as well as fire drills and tornado drills to name a few, some of our students find that since it’s just a drill they don’t have to remain silent. They feel they can walk away to find their friends when we are outside. Not all of the students. In fact, not most of the students. I have gone over our safety procedures in all of my classes. They know where to go, what to do, and how to listen for important instructions. All any of us want is for our children to be safe. 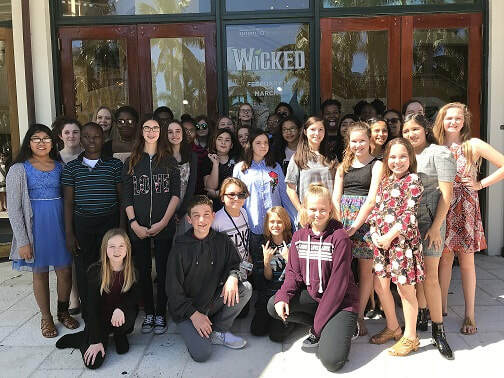 Moving on to a lighter subject, Thursday 36 of my students went with me to the Broward Center to see the show “Wicked”. The students were on the edge of their seats during most of the performance. I’ve been getting lots of thank yous and hugs from the kids. They all had a wonderful time. I was so happy to watch their faces during the show. I must compliment the students on their behaviors. They were excellent and I was proud to be their teacher! I am including a photo of the kids who attended. This week we begin Chapter 12-dramatic acting. We will be reading dramatic scripts and start utilizing all of the characterization techniques they have been working on. I hope you have a great week…..